You may not know the name David Harvey as well as you know The Moody Blues. They became stars during the 60's and into the 70's at a time when radio embraced groups who took chances. The Moody Blues came before Emerson, Lake, & Palmer and Yes in the nicknamed categories of "art-rock" or "symphonic-rock." Like many of us who grew up on this English group of heroes, David was also a fan. Today he is a producer and session player, mostly on mandolin. 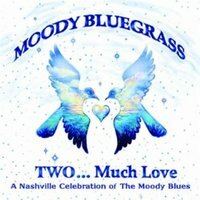 He puts both talents to work once again on a follow up to the first Moody Bluegrass release in 2004. The album kicks off with Vince Gill powerfully delivering "I Know You're Out There." This song is for all the lonely-hearts, then and now, inspiring them to hold on until their soul mate arrives. Chances are you'll be singing along instantly, especially if you are a baby boomer. This album features one of the last recordings Harley Allen ever made, and it is sweet to hear his widow, Debbie Nims, harmonizing with him once again. Harvey has once again sparked conversation with these arrangements, but pulls them off with such class that any suggestion of novelty instantly disappears once you listen. He adds vocal harmony (The Settles Connection) and strings at the right moments, but mostly lets his cast of stars deliver. And they do.